FREE ESTIMATE. To buy, auction, sell or consign your Queen Liliuokalani autograph that is for sale, please email Nate@NateDSanders.com or call the Nate D. Sanders Auction House (http://www.NateDSanders.com) office at (310) 440-2982. Stunning piece of U.S. political history in which the last monarch of Hawaii grants denization to the man who would lead the coup against her monarchy the following year. 30 June 1892 document signed clearly by Liliuokalani, the Queen of Hawaii from 1891-1893 before it was annexed by the United States, details the “Denization” of Henry Ernest Cooper, an American citizen and businessman. Just one year later, as Chairman of the “Citizens’ Committee of Safety,” Cooper would plot and effect the overthrow of Liliuokalani’s kingdom, ultimately reading the proclamation establishing the provisional Government of Hawaii on 17 January 1893. The very next day he was appointed to the advisory council to President Sanford B. Dole and would alternatively serve as Minister of Foreign Affairs, acting President and Attorney General of the new Republic of Hawaii. 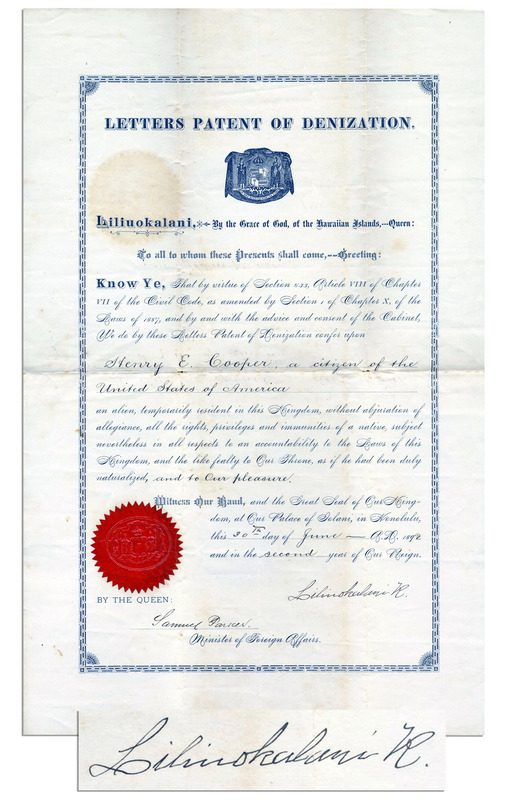 Document reads in part: “We do by these Letters Patent of Denization confer upon Henry E. Cooper, a citizen of the United States of America…temporarily resident in this Kingdom, without abjuration of allegiance, all the rights, privileges and immunities of a native, subject nevertheless in all respects to an accountability to the Laws of this Kingdom, and the like fealty to Our Throne, as if he had been duly naturalized, and to our pleasure.” It was signed at the Palace of Iolani in Honolulu and is countersigned by Minister of Foreign Affairs Samuel Parker. It features a royal seal and measures 11″ x 17″. Some creasing from folding, minor chipping and discoloration where a second seal was once apparently affixed. Overall in very good condition. Sold for $1,156. Queen Liliuokalani Autograph. Click to enlarge.